Fig. 1. 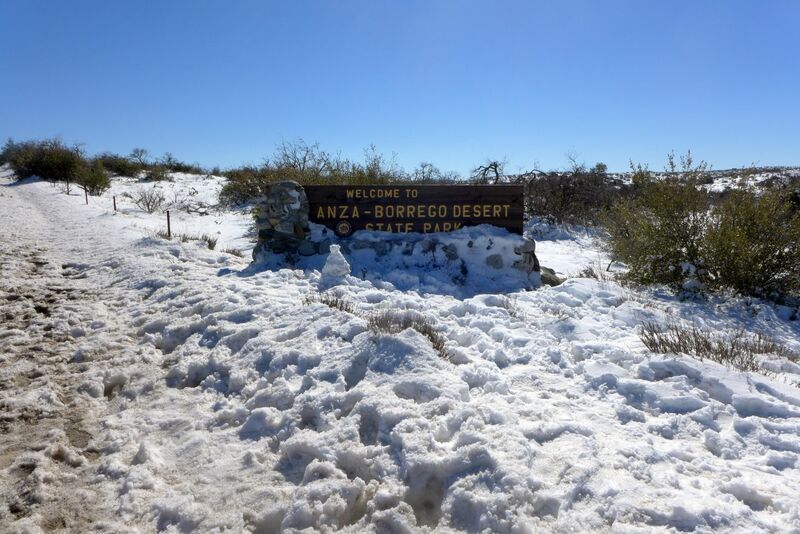 Left: The Ranchita ABDSP entrance sign at 4200 feet elevation on 23 February 2019. Right: Monoptilon bellioides, desert star, in full bloom at 1000 feet elevation just south of Canebrake. This is just one of over 100 species in bloom in that area, with an almost uncountable number of plants in bloom from those 100 species. The Borrego Desert floor, at elevations below 1500 feet, is now in full bloom everywhere. You don't need anyone's recommendations about where to go; you can hardly go wrong anyplace, as long as you are below 1500 feet elevation. The major problem, especially on weekends, is where to go to avoid crowds. Full bloom in most areas began around 1 March, and because of the amount of rain in most places, the bloom on the desert floor should last most of March. Some areas that received October rain have been in full bloom since 1 February, and should also remain in bloom throughout most of March. As you can see from Fig. 1, it has been cold and snowy at elevations above 3000 feet, so hardly anything is blooming at those elevations. The best webpage that gives a small number of recommended places in the Borrego Springs area, with good maps showing where those places are, is Wildflower Updates from the Anza-Borrego Desert Natural History Association. 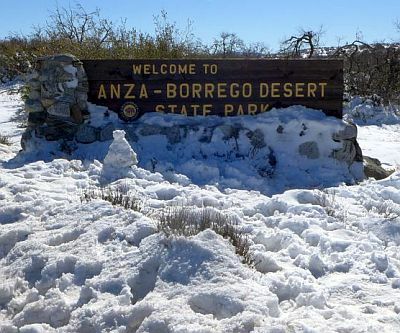 However, you may want to think twice about going to the ones near the town of Borrego Springs and the ABDSP Visitor Center, especially on weekends, since those areas are likely to be jammed with people and cars. Instead, you might consider places reached by driving SR78 east of Scissors Crossing, and areas in the southern part of the park along S2, from Agua Caliente County Park south to Carrizo Canyon. Some of those areas are shown on a map linked from the Wildflower Updates page. There are two other ways to pick a place you might enjoy. First, you could peruse Fred Melgert and Carla Hoegen's Anza-Borrego Wildflowers Bloom Report page. They hike five out of seven days, and post their findings the same night, usually with links to a large number of pictures of flowers observed on each hike. There are so many choices on their page that you can easily pick a place you'd like to see that won't have overwhelming crowds of people. Second, you could use the crowd-sourced iNaturalist to pick places that have species in bloom that you are interested in. You can get almost daily updates on what is blooming in the Anza-Borrego Desert, as well as where species were found. Click on "Filters" and select a date range to see the observations from that period. For example, here are all the observations on 1 March 2019 and later, including 269 observations from just the first two days of the month! Each observation gives the date and time of observation, and the latitude and longitude for each observation, which is plotted on a map for you so you can see where it was from. If you find species at iNat that you are interested in seeing, you can search just for recent observations of those species, and go where you see the most observations. For example, if you want to see ghostflowers in bloom, there are 34 observations posted between 20 February and 2 March 2019. Clicking on the "Map" tab shows there are six separate locations where observations have been posted. 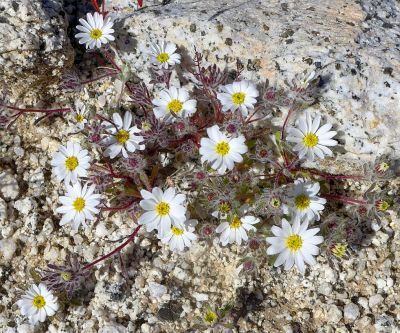 Anza-Borrego Wildflowers Bloom Report by Fred Melgert and Carla Hoegen, often with daily wildflower updates. Wildflower Updates from the Anza-Borrego Desert Natural History Association. Anza-Borrego Desert State Park official site, with wildflower information on it. Click on the link near the top with the word Update, which might be updated weekly. Anza-Borrego Desert Wildflowers, by Fred Melgert and Carla Hoegen, a pictorial guide to identify wildflowers. Copyright © 2008-2019 by Tom Chester, Fred Melgert, Carla Hoegen, Walt Fidler, Nancy Accola, Don Rideout, Kate Harper, and Birgit Knorr.